They talk about a cultural shift, about the idea that a good meal does not have to be – often is not – a chunk of meat on a plate (though there is still a place for a great steak dinner.) And that, while vegetarian and vegan alternatives can be wonderful, they’re not the only option. Instead, consider plant food with smaller amounts of meat or other animal protein. Which is, you know, what much of the world has always eaten, and the basic concept behind many of the best traditional recipes. Think Cassoulet. 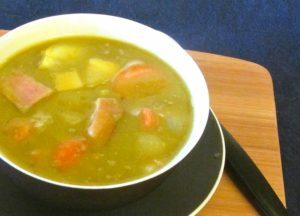 Pea soup with ham. Chili con carne. 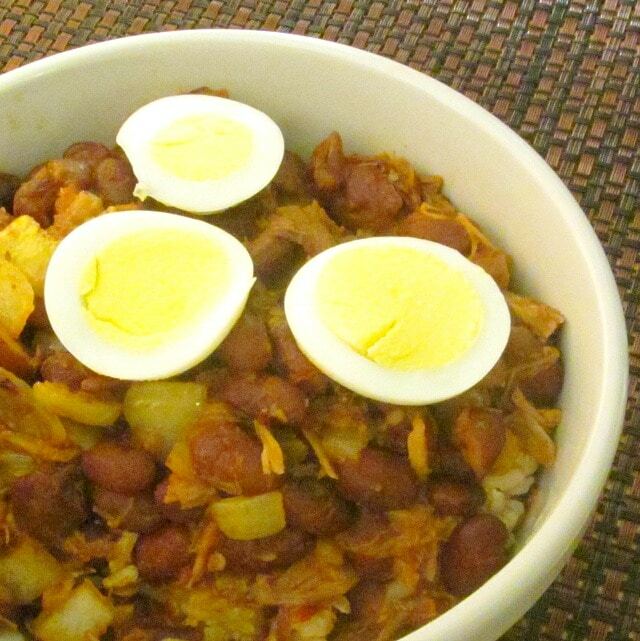 Boston Baked Beans. A Chinese meal with three or four dishes, and small amounts of meat in one or two of them, perhaps tofu in another. Spicy black bean soup with hard cooked egg slices floating on top. An Indian Thali – platter – with a little mutton here, or a little paneer there, and a bowl of dal. Tapas or other small plates. 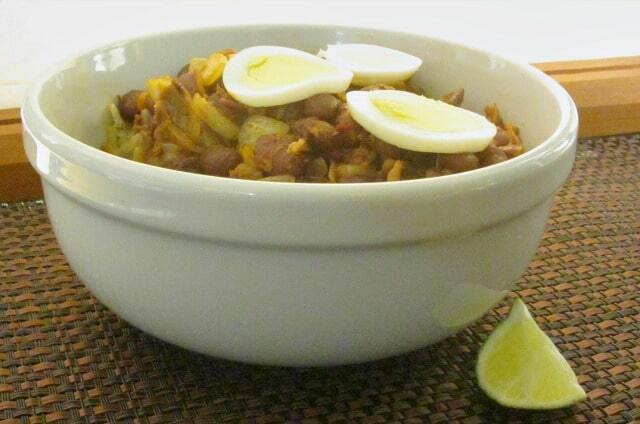 Rice and beans as the absolutely mandatory “side dish” in much Caribbean cooking with whatever else is served. The Red Beans and Rice I’m told are a Must Have in New Orleans, that home of fine food. And – well – the way I cook… much of the time. Now, I generally try not to go all Nutritiony at you, but I have to, briefly, here – bear with me, please. OK – the CIA quotes the RDA for protein – but that’s for the theoretical “Average Person.” Who is pretty theoretical… and while it is no longer called the Minimum Daily requirement, as it used to be, it is still really a bottom line, a Don’t Go Below This. But many Americans eat twice that or more – and very few people need that much. Protein requirements actually vary quite a lot by body type, activity, and health. A man who is 6’5″, broad shouldered and muscular, and works on a loading dock will need more protein than a man who is 5’10” and slim, and sits behind a desk. On the other hand, if it’s the big guy behind the desk and the small one stripping out pallets and moving cases, they may need the same amount… or the smaller guy may need more. And the guidelines assume that women are all smaller and need less – but again, a taller, more active woman needs more protein than a sedentary man her size. And of course, pregnancy and nursing seriously increase protein needs – as does recovery from injury or ill health. Most of this fits our experience when we think about it, but doesn’t seem to make its way into the charts and recommendations… Guidelines, not hard and fast Rules. A large egg is one Lump. An ounce of meat is one Lump. Half a cup of whole cooked beans, an ounce of firm cheese, an ounce of nuts are each one Lump. An ounce of fish is one Lump. 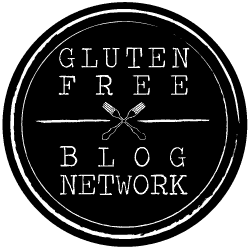 (Soy foods, seitan, vegan burgers, and so on vary by production method – read the label.) One Lump of a protein food, in this system, is somewhere around 6-8 grams of protein each… This kind of meal planning is all about averages, not precise measurements at every single meal, but you may notice that you need a little more or a little less of any given food – we need a little more fish, for instance, which is on the low end, than we do of other foods. I generally write recipes with four Lumps of protein per serving. 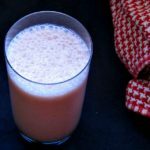 Most adults seem to need somewhere in the range of three to five in a meal, so this can be varied up or down a little without affecting most recipes, and this amount seems right for Rich and me. Now, if you eat a pork chop, that’s a four ounce boneless chop, which may seem small if you’ve eaten six ounce chops all your life… On the other hand, it’s four eggs, or two cups of cooked beans, which may seem overwhelming. Rich used to complain that he’d never been able to eat eggs for lunch, because they left him hungry – then I realized he’d usually eaten only two eggs… occasionally three. I started serving him two eggs with a side of beans, or some cheese, and now that’s his go-to lunch if I’m not home to cook. What does this look like in real life? Well, take a look at my What I Ate Wednesday posts, or most of my bean recipes. What does it look like in the kitchen? How does it work with Planning For Meals? Does it get boring? 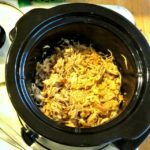 I cooked a pork shoulder last week in the slow cooker, shredded the meat, and put it in containers in the refrigerator. (For some reason pork shoulder has been readily available in my local store, recently, but the loin I often buy has not. So shoulder it has been…) Then I returned the bones and scrap – skin, fat, and whatever bits were still stuck with them – to the pot, covered with water, added salt and a splash of vinegar, and let that cook another 24 hours. I strained that, put some aside for other use, returned some to the pot, added soaked red beans, and cooked them until done. 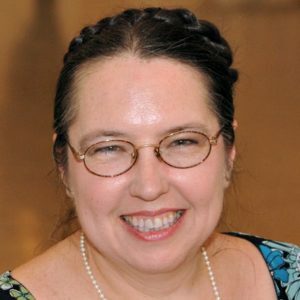 For me, this is a process, one step flowing into the next, and at the end I have meat, broth, and beans flavored by the meat… ingredients for many meals. Most of those beans were then refried for breakfast tacos – but not all. 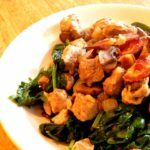 For this simplest and fastest option, I wanted to demonstrate a quick weekday dinner made with food from the fridge, not much time, not much energy. So – pull out your cooked meat. This could be pork, like this, or chicken (home cooked or from a rotisserie chicken) or leftover pot roast, or… And cooked beans – home cooked like this, or a can. 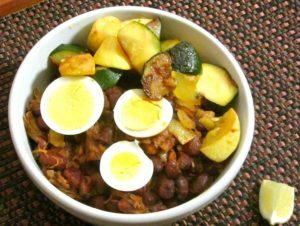 And you want something to flavor it… If I’d had chick peas I might have used curry powder, with azuki, soy sauce, these were red beans and I have pureed chipotle in adobo on hand, so I went in a quasi Mexican inspired direction. Chop a small onion, and saute it – add garlic if you like, and a teaspoon of ground cumin. When the onion is soft, add the cooked meat. Now – here is the planning… I had a pint of cooked beans – that’s four Lumps of protein. I needed eight for a full dinner for the two of us, and did not plan another course with substantial protein. I wanted to illustrate some of the choices we have, and I also wanted to demonstrate a meal with half animal and half plant protein, so I decided to use three ounces (Lumps) of cooked pork, and one hard cooked egg. I do like to have hard cooked eggs on hand, because they are so easy to use this way. 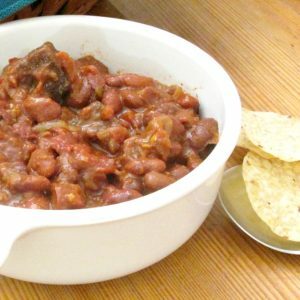 Now, if you were using, say, a can of kidney beans – which would generally be a cup and a half (three Lumps) – you might want to use four ounces of meat, or an extra egg, or neither if you don’t need quite as much protein… Or you could use two cans of beans, only two ounces of meat, and skip the egg (or add it because your family needs more protein.) The whole process is incredibly flexible. 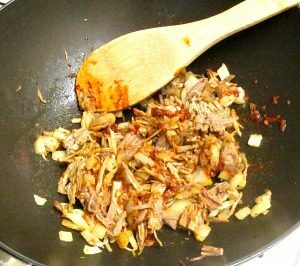 So – using my measurements, put three ounces of meat into the pan, and one tablespoon of the chipotle puree. Stir and let heat, then add the beans, and half a cup of water or broth. Bring to a boil, and let simmer five minutes to meld flavors. Serve over brown rice, or millet, or with cornbread… and, of course, with vegetables. This was longer than usual, and the recipe is a bit sketchy (so you can vary it for yourself!) but it is something I’ve wanted to talk about, and the news stories about The Protein Flip gave me a push. 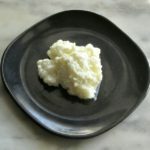 I will start using Protein Flip as a tag – I’ve been wondering how to describe this way of cooking. 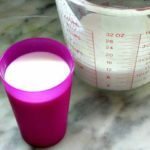 I do, and will, eat some vegetarian or vegan meals, and write about them – but I think that for most of us, and most of our families, it will be easier to cut down on meat this way than to eliminate it several days a week. 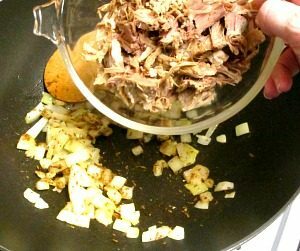 Protein Flip - a term for moving meat and other animal protein from the center of our attention to the side, as in this recipe for Red Beans with Pork. Heat oil in saute pan. Add onion, and saute until starting to soften. Add cumin, stir, add pork and chipotle. Stir and let heat a few minutes. Add beans and half a cup liquid. Bring to a boil, then simmer for five minutes, to heat evenly and combine flavors. Peel and slice or chop hard cooked egg, and use it to garnish. I love the idea of a protein flip -- such a fun way to make meals. And the idea of cutting down meat a bit is such a great way to experiment with veggie recipes! Honestly, it gives me more variety than if I were eating pork chops and burgers all the time... And it is so traditional. I love this idea. We are definitely more of this mindset. Especially since having kids who are not interested in eating meat at all. So, it's little bites of meat supplemented with peas, beans, cheese, nuts, etc. Thanks! And there are so many ways to do this... I noticed that one of the Culinary Institute's guidelines for chefs was to stop thinking of Meat and Protein as synonyms... and once we break that mindset, a new world opens. Protein Flip. Hmm something to think about. I should help to limit meat consumption and help us eat more vegetables. This beans sounds delicious. I love beans! And I love the idea of cutting down on your meat consumption.. This is a great way to get started! I love the variety of beans... I can eat beans three times a day and never repeat anything... 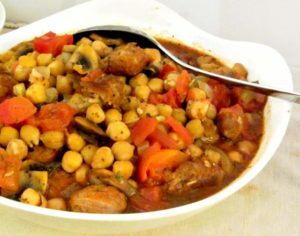 Somehow I never need to tell anyone that a recipe will taste different if you sub chicken for pork - but switching in chick peas for pintos will give you an even greater change! And this just makes it so easy. 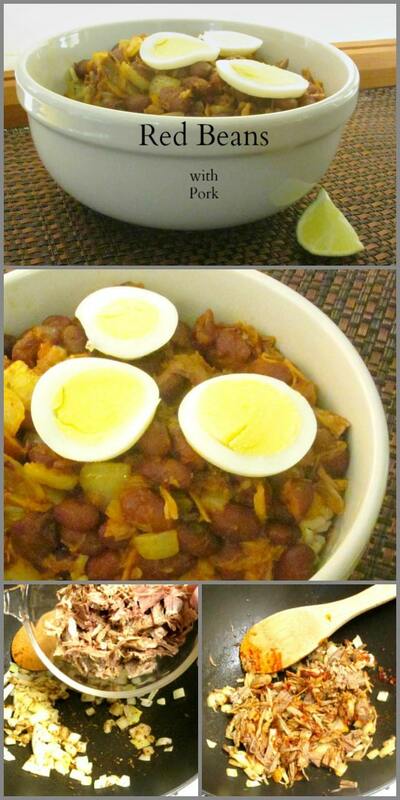 This reminds me of red beans and rice that my sister in law makes (which are amazing), except even more filling! Can't wait to try this! Red beans and rice is so delicious, isn't it? I love to see so many of the traditional foods! Enjoy it!